As always, we appreciate and send thanks to all of you who joined us at the September Greater Atlanta Coin Show. We also want to thank our dealers, our security and the hotel staff. Also, a special thank you goes to those road warrior dealers that drove from the Jacksonville show to set up at our show. The September coin show saw many people browsing, buying, selling and trading with the dealers on the bourse. As for the weather, the sunny day had temperatures in the low 70s, and with the lower humidity, the sky was a beautiful clear blue. This month's coin show showcased many special items. First, dealers displayed several certified paper notes with authentication, grades and identification on their special holders. Even though the show is called a "coin show," it is really a numismatics and collectibles show. Merriam-Webster defines numismatics as the study or act of collecting of coins, paper money, and medals. Each month several of our dealers offer various types of paper currency, financial documents (such as, stock certificates) and other exonumia. For another interesting example on the bourse, a dealer displayed a Cincinnati Music Center PDS Set in its original holder. Those coins in their original holder can be quite rare. Of course, many of the "found" 1964 proof sets with the "Accented Hair" have been cut apart and the coins certified. It would be interesting to know how many existed in the first place. This one certainly demonstrates that they can still be found, and because they can, their premium over a regular set is not that great. In other words, a collector won't get rich finding "Accented Hair" proof sets. But, it is the treasure hunt and the finding of the different variety that satisfies the collector. The next examples from the coin show happen to showcase how the certification process can vary. Let's look at a 2012 American Silver Eagle-actually, several of them. This picture shows a Philadelphia ("P") version of the 1936 Cincinnati Music Center Commemorative Silver Half Dollar Coin. There are actually two things that differentiate the "Accented Hair" variety. First, and obviously by the name, the hair over his ear is cut deeper and almost looks like a wishbone. Second, the lower left serif on the "I" in LIBERTY is missing. In total, the US Mint produced 3,950,762 (per the Red Book) 1964 Proof sets. In their book, Mr. Gale and Mr. Guth did not explain how they determined "30 times as rare." Or, did they mean something else? The certification labels on each coin's protective holder also include "First Strike" and "75th Anniversary SF Mint Set." 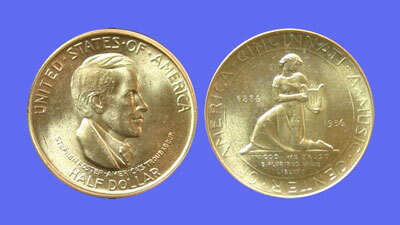 And, this "regular" proof is also graded "Deep Cameo" but as a Proof 69 with the reverse proof also a Proof 69. With the second two coins in separate holders, they will at some point be separated as they journey from collector to investor to collector...etc. The combined holder for the first two coins keeps the two coins from the US Mint's collectible set together. They may not find as many interested collectors or investors on their future journey, however as a Proof 70, they will still generate plenty of interest. The September bourse and its dealers offered many more coins, bullion, currency and collectibles to pique the interest of the visitors. Next month, the bourse will again be full with the dealers displaying similar items along with newly found collectibles they obtain between the monthly shows. Visitors are welcome to browse, buy, sell and trade coins, bullion, currency and related collectibles with the dealers at the Greater Atlanta Coin Show. Mark your calendars for the next Greater Atlanta Coin Show on Sunday, October 11, 2015 in the Joe Mack Wilson Ballroom. Now, imagine three of those in one set as it was offered by the US Mint in 1936. Originally, the Mint only distributed the coins in the three-coin set that sold for $7.75. Just think, this set survived 79 years without someone breaking the set and selling the coins separately or perhaps having them certified in special holders. The coin shown is in a PCGS holder graded as MS64, but sadly, it has long lost its companion coins from Denver and San Francisco. Next on the highlight list is a 1964 proof set, but this set is different, not unique, but different from most of the 1964 sets. 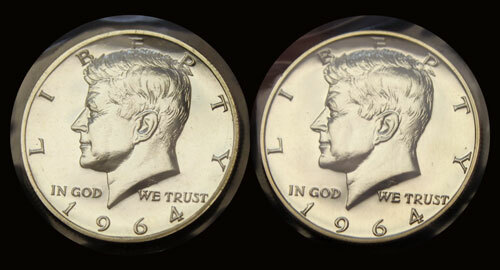 This particular proof set had one of the proof Kennedy half dollar coins with the accented hair. 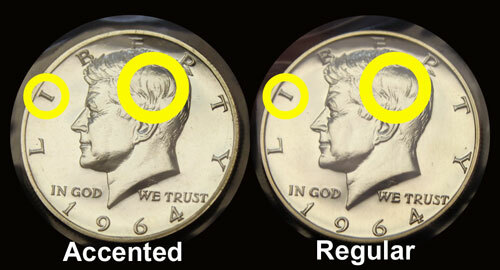 "Some Proof 1964 Half Dollars are found with what is known as 'Accented Hair' where the hair on Kennedy's head is more heavily defined. The 'Accented Hair' variety appears to be thirty times as rare as the normal hair proofs." Oddly, the Red Book does not identify an "Accented Hair" proof set, however they do list a "Heavily Accented Hair" coin variety under the Kennedy half dollars for 1964. So, what does an "Accented Hair" proof coin look like? First, here's a side-by-side comparison. Can you spot the differences? These first two examples illustrate how the certification process can place two related coins in the same protective holder. These coins were both graded Proof 70 with the one on the left additionally graded as "deep cameo." The left coin is a "regular" proof and the right is the companion "reverse" proof coin. The certification labels on the one holder for these two coins include "First Strike" and "75th Anniversary SF Mint Set" for additional identification. Comparatively, here are two more of the 2012 American Eagle Silver proof coins, also certified but in separate holders. Again, the one on the left is the "regular" proof with the one on the right being the "reverse" proof coin.